Lightness! SkyActiv engines! Ovals! The next-generation 2015 Mazda Miata is said to be getting all of these things when it becomes a reality sometime next year. Here's the latest. According to a report in Australia's Motoring that cites unnamed insider sources at Mazda, the new "back to basics" Miata's design will hark back to the original NA Miata, complete with an oval-shaped grille. They even say early designs for it drew from the 2003 Mazda Ibuki concept, pictured above. 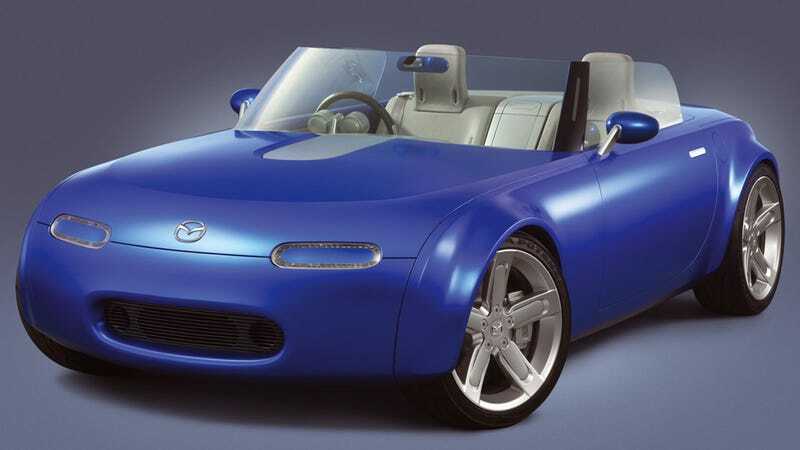 Interesting, our insider revealed that the Ibuki concept car shown at the 2003 Tokyo Motor Show was actually an early design study for the next generation MX-5. But that project was shelved around 2005 and then rekindled in 2008. That's why the first design concepts of the new roadster resemble the Ibuki. Even better news for Miata hooligans is that the next one, according to this story, is targeted to weigh the same as the original, about 2,100 pounds. I'm pretty skeptical of that last claim since it's a hard goal to achieve with today's safety standards, but I'd love it if Mazda pulled it off. Motoring also says the next Miata should get the 1.5-liter SkyActiv four culled from the non-U.S. market Mazda3 but tweaked for more power and torque. Here's another interesting tidbit: they say the Alfa Romeo roadster version will have a 1.4-liter turbo engine developed by the folks at Fiat, as well as a dual-clutch transmission. That sounds fun too. Take all of this with a grain of salt, but it sounds more or less reasonable so far. Why do we have to wait a year for the new Miata? I want it now!